It’s time for the last challenge of the month on Our Daily Bread Designs! Our challenge this week is No Coloring. Since my husband’s birthday is approaching I decided to create a clean and simple birthday card for him, using stamps and dies from the new release. I stamped the new Life is a Gift image twice and added a tiny bit of glitter glue to it. I stamped and heat embossed in silver the word happy from the same set on vellum and then used the “birthday” word from the new Happy Birthday Dies to complete the phrase adhering the word die on the stamped vellum. To finish my CAS design I created a simple frame combining the largest die from Flourished Star Pattern and a smaller matting basics die. To see all the projects created for ODBDSLC228 or to join the challenge click here. You have until March 1, 2015 at 8:00pm EDT to join us. By participating in the challenge, you have a chance to win a $15 ODBD Gift Certificate good towards the purchase of stamps in the “stamps column” on the ODBD website, or to be spotlighted on the ODBD Blog at our next challenge. The random prize winner will be posted on our next challenge post. Please take some time to visit my DT sisters and be inspired by the beautiful cards they created for today’s challenge! Love these all textures and the red tones Gracielle,,,,,,,,,you are always surprisiing me. Great card – I always love the way you use vellum. Lovely card. Love the way you made the sentiment. Love your red and white card! Those wildflowers are beautiful. Mine are so light I'm not sure anyone will see them under the scripture!! Love the bold embossing of red! 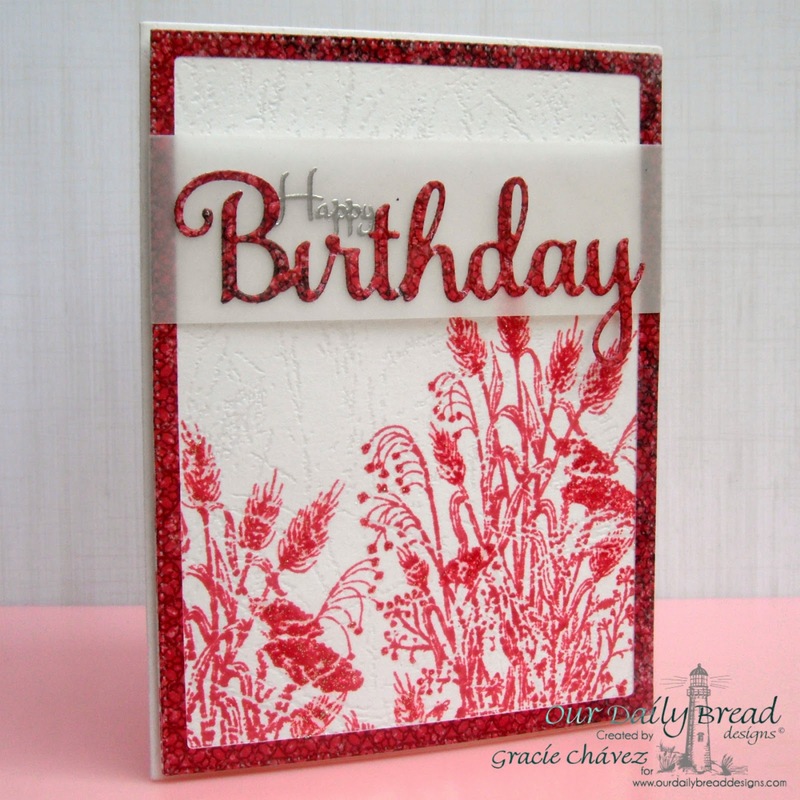 The red paper you used is beautiful as well especially on the die cut Birthday! Beautifully done my dear friend! Oh, Gracie, this is gorgeous! 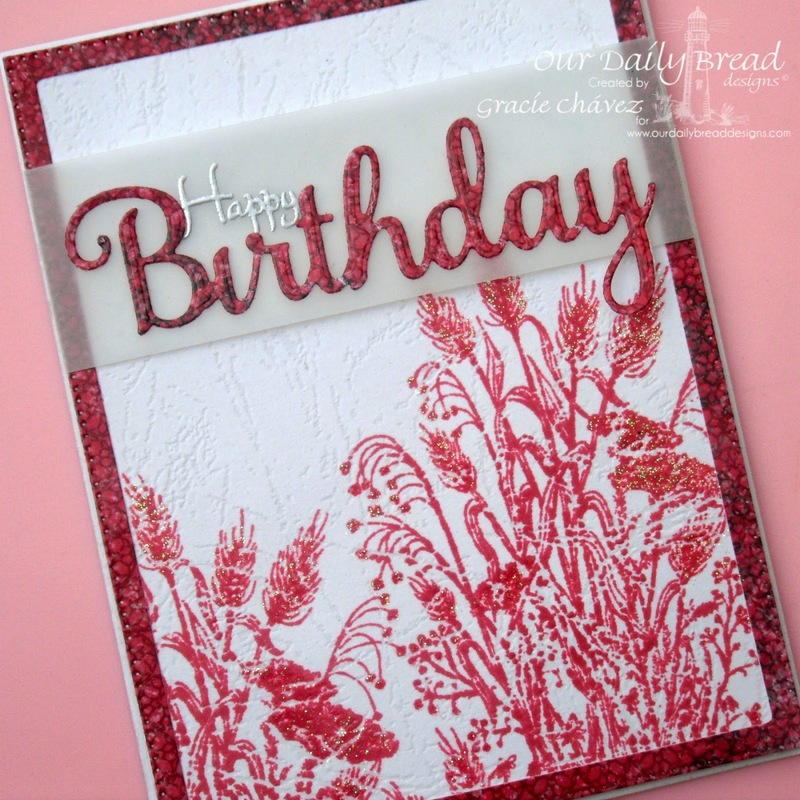 Just love this color and the wildflowers with the birthday die! Stunning! Hugs! I would not have thought to do red and white with this stamp and it looks fabulous!!!! The vellum is a nice tough too Gracie!!! Hugs!! Your card is beautiful Gracie!! I just love the wild flower silhouettes stamped in red on white leather. The patriotic paper is the perfect frame. Beautiful layout and design my friend! Beautiful card Gracie! I love the frame you made and such an awesome sentiment panel!